One of the things I’m working on in the new year is taking the time to do more crafts. Both of my boys are super creative and LOVE to make things but often in the craziness of daily life, I forget to stop and help them create. But, I have recently discovered that making a cute craft does not have to be an all day thing. In fact, with MillerBug, it’s better if it’s short and sweet so that he doesn’t lose interest. 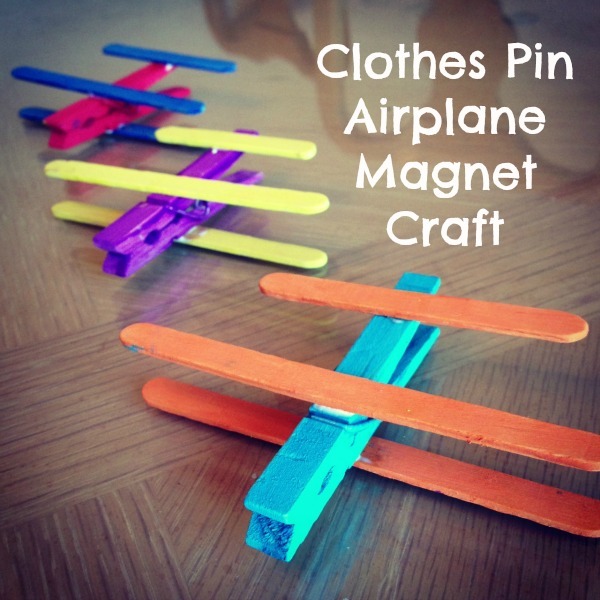 Yesterday we made Clothes Pin Airplane Magnets and it was so much fun! And our finished product turned out super cute too! 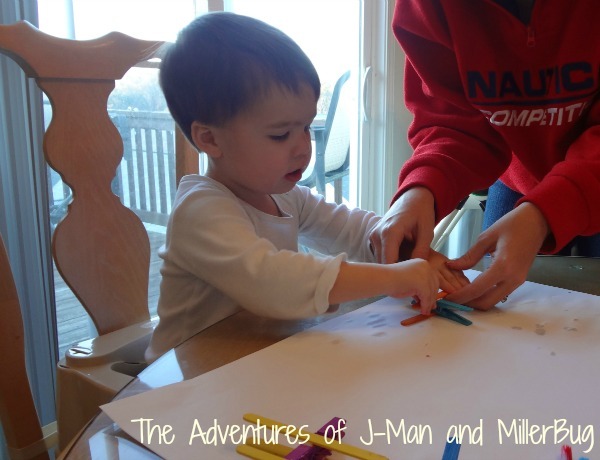 So, if you have about an hour and a toddler or young child who is eager to create, check out this fun craft that will zoom you to the funnest mom around title! 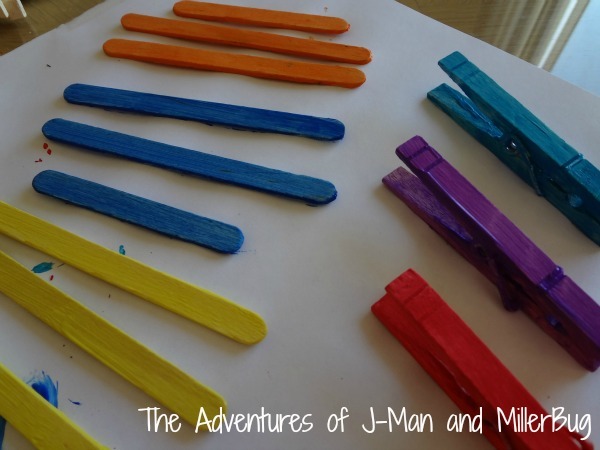 There are two ways you can go about the painting of the clothes pins and popsicle sticks. If your child is old enough, let them do the painting. 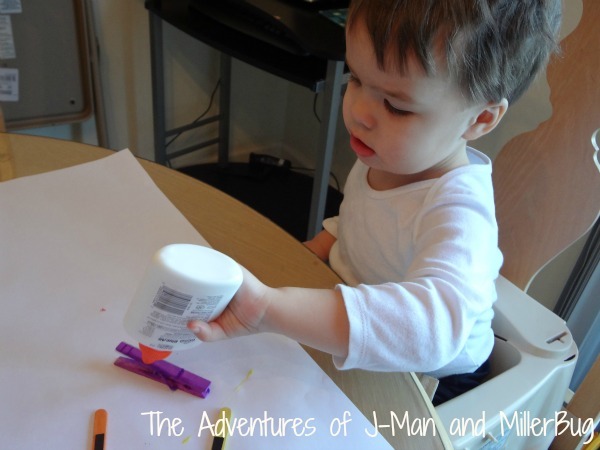 If you have a smaller child, go ahead and pre-paint your items using bright colors. 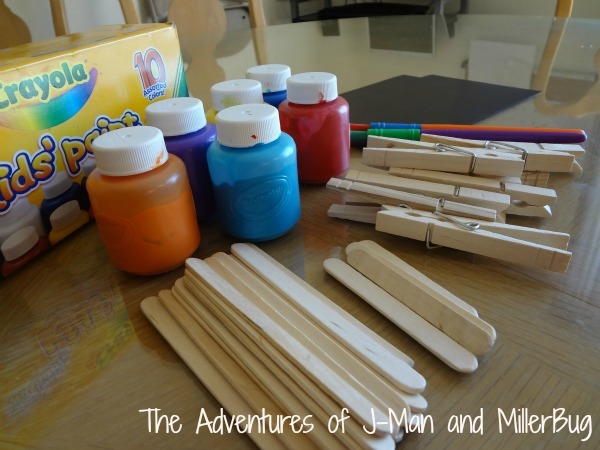 Be sure to use different colors for the clothes pins and the popsicle sticks. Then set them aside and let them dry. 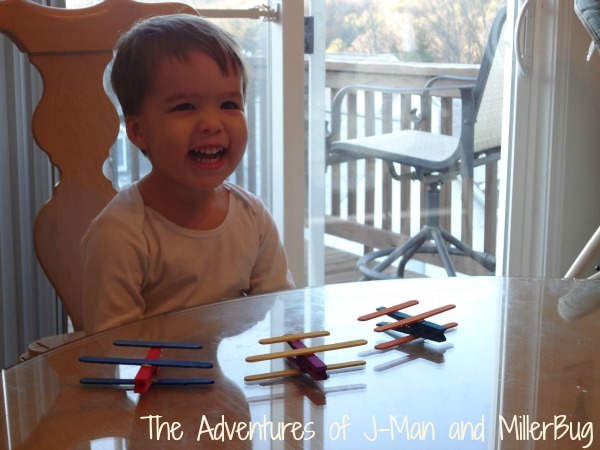 Once your paint is dry, you are ready to enlist the help of your child to assemble their airplane. Start by cutting out a portion of the magnet to fit on the back side of one of your long popsicle sticks. Using a double sided magnet is great because you simple peel and stick. Then, let your child help you put dots of glue on the clothes pin. Once all your “wings” are glue on, set aside your airplanes and let them dry. MillerBug was so thrilled with his creation that he could hardly wait for them to dry! Once your airplanes are dry, you’re ready to give them a home! Let your child take them to the fridge and find a place to put them. They will love zooming them around and be thrilled with the fact that they “stick” on the fridge. 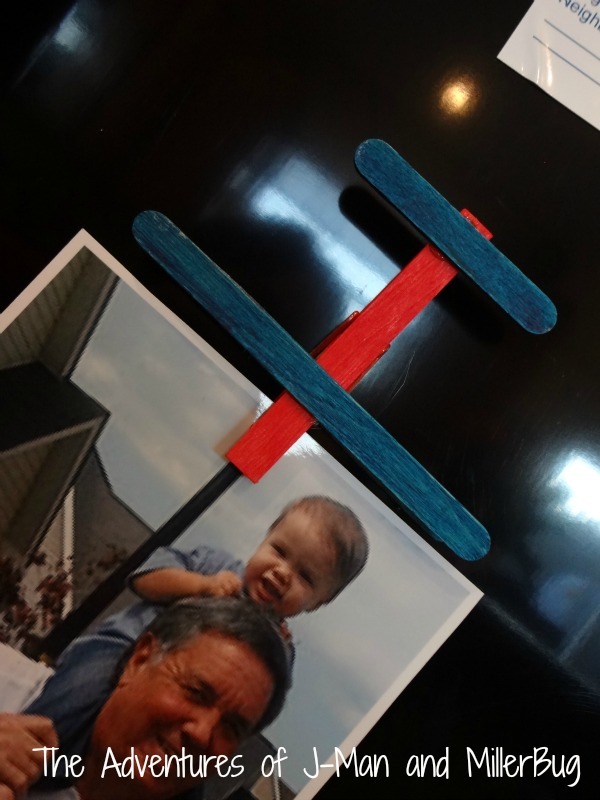 Then use your magnet as a fun way to keep up with papers, display pictures and more! 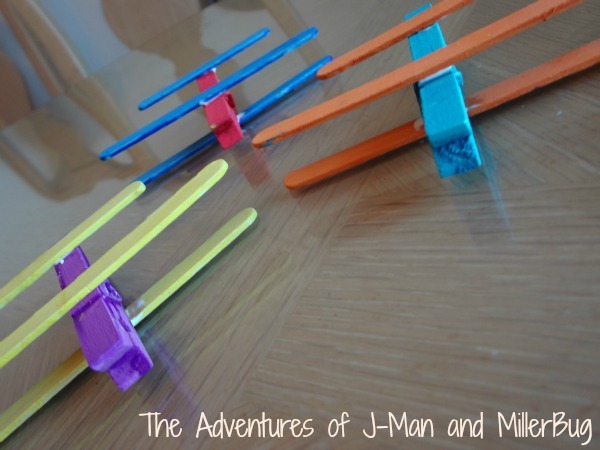 So the next afternoon that you are looking for a fun craft, let this super simple yet delightfully fun clothes pin airplane magnet zoom into your mine! I love this idea! I’m so going to invite my nephews and young cousins for a craft day!!! 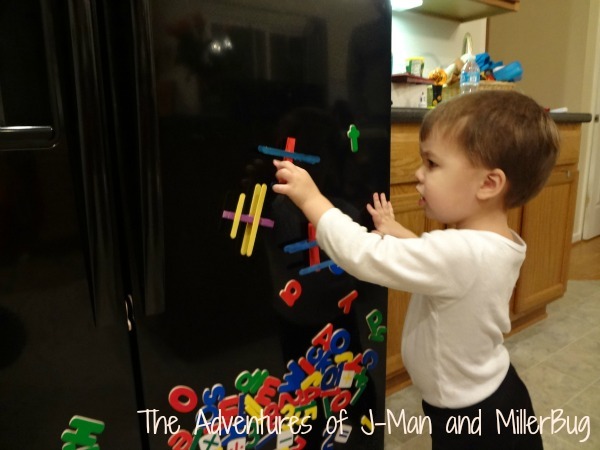 Thank you for sharing this is a great way to get the kids entertained and also display pictures on your refrigerator door. Love this …easy to do and looks cute on fridge! These are adorable and look easy and fun to make! These are sooo cute!! Great craft! Thanks for sharing. My little man (one) LOVES anything transportation! As I was looking at this online he started saying “ooh Mommy!” I will definitely keep this in the crazy list. I am going to definitely pin this one!!! cute idea .. I have to try this when we have a play date with another boys around! Thanks!